Do feminists make bad moms? Several people have recently sent me Janet Benton’s essay “A Feminist’s Daughter Finds Love in the Kitchen“. In the essay, the author outlines her childhood loneliness, malnutrition, and boredom, blaming feminism for her mother’s failings and lacks. Benton’s essay is problematic on a big-picture level; she scapegoats feminism as she describes her mother’s passion for art and activism, and by doing so positions motherhood and feminism as both diametrically opposed and mutually exclusive (at least, it seems, if you want to be “good” at either). In a culture that puts so much value on the nuclear family, the epithet “bad mother” is one of the worst a woman can hurl at another woman; placing feminism on the same side as bad motherhood is a clear indictment of the movement. While Benton fills her essay with heart-rending descriptions of a lonely little girl, she fails to make a convincing argument for the connection between feminism and her mother’s shortcomings. It also ignores the difficulties and challenges of single parenting that her mother may have encountered, instead using her mother’s failings as a foil to her own parenting successes as she gloats about the “mutually enhancing sort of love” that she and her daughter experience when they cook together in apparent domestic bliss. While it is admirable that Benton wants to be a good parent, claiming that feminism or self-fulfillment is an obstacle to that goal is pointless at best, harmful at worst, and an insult to all of her feminist peers who have children. Benton’s essay also made me feel defensive on this larger level, it hit home for me as a feminist who grew up happily with a feminist mother. 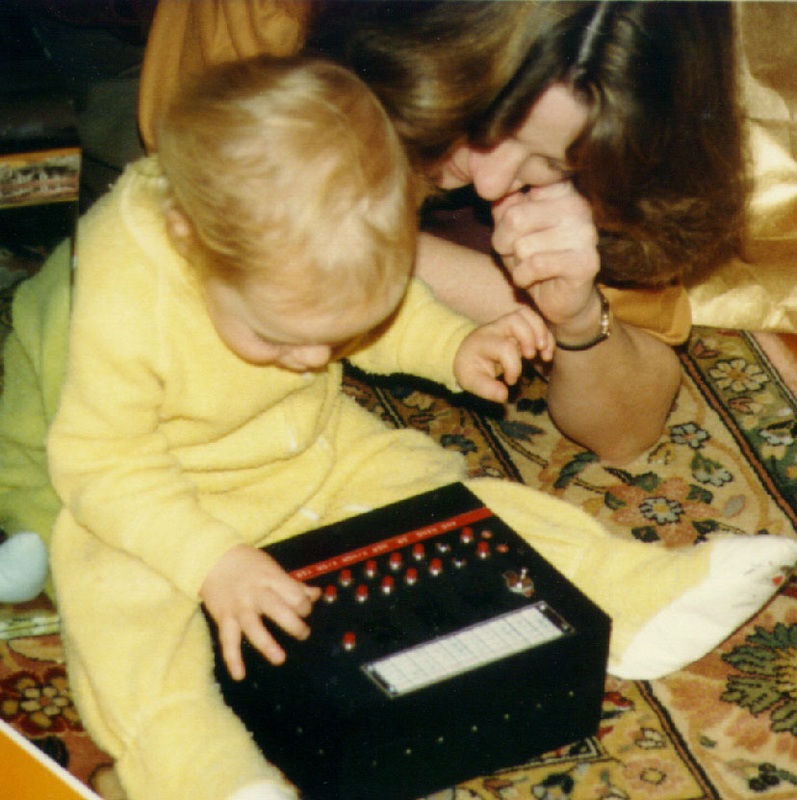 My mother helping me learn how to use an electronic computer game that my grandfather made for me. Oddly, I don’t know if my mother identifies as a feminist. It seems like an awkward question to ask. However, the signs are all there. My mother did not change her name when she got married, nor did she stop working when she had me. I was cared for by a babysitter during the day, and by my grandparents on the occasional weekend that my father was away on business and my mother needed a break; this did not mean that my mother was not 100% committed to me. Once my sister and brother were born, my mother did quit her job, and threw herself into raising three strong, independent, successful children. I was given gender-neutral blocks, books and games as a child, and my imagination and intelligence were developed and challenged. Later, when I wanted dolls and Barbies, I was allowed them as well. When my athletically talented sister wanted to join three different basketball teams, my mother drove her to countless practices and cheered at her games. When my brother was diagnosed with ADHD, she threw herself into researching the condition, became his strongest advocate, and worked tirelessly to help him succeed in school and in life. While my mother did not participate in protests and rallies like Benton’s did, she made her commitments to activism and social causes a part of her – and our – everyday lives. She was committed to the environment, regularly donating to Greenpeace and fanatically recycling all the way back in the wasteful 80s. Like Benton’s, her convictions were sometimes the source of my unhappiness; I remember very clearly the resentment I felt as I pulled my Tupperware of vegetables out of my cloth lunch bag, envying the plastic-wrapped, preservative-filled treats that emerged from the other students’ uniform paper bags. However, I was always made to understand that my mother made these choices for a reason. My mother knew the value of being a role model; she was the leader of my Girl Scout troop, taking us hiking, involving us in volunteer activities, and even gamely accompanying us on camping trips. At the holidays, our craft fair profits benefited a battered women’s shelter. Always one for equal opportunity, she also took on the role of den mother for my brother’s Cub Scout troop. Yes, being able to stay home with her children was a privilege my mother had that many other mothers do not, feminist or otherwise. But she worked hard for that privilege. My mother clipped coupons, sewed our holiday outfits, and shopped at thrift stores. She took part-time work here and there, going back full-time when the economy temporarily cost my father his job. Through all of this, we never felt neglected. In an almost direct contrast to Benton’s mother, my mother showed love through food. She made sure we had a balanced, healthy meal on the table every night, and my holiday memories are filled with her handmade chocolates and coffee toffee pie. She also incorporated food into her involvement with social causes. There is always a grocery bag in the corner of the kitchen that she fills with extra canned goods when there is an exceptional sale; once the bag is full, it goes to the food bank. When I volunteered at an LGBT youth homeless shelter in New York, my mother volunteered to cook the meals that I would serve to the shelter’s residents – she was horrified that these youths, in addition to dealing with homelessness and the challenges of navigating the streets, might also have to eat my cooking (unlike Benton, I did NOT find love in the kitchen). Near the end of her essay, Benton half-heartedly and begrudgingly admits that “Whatever else she is or isn’t, my mother is an inspiration. She has had the courage, vision and persistence to create a meaningful and satisfying life.” These lines feel forced and wooden, lacking the detail and illustration of the scenes of neglect and emaciation earlier in the essay. I hope that Benton has found some kind of peace with her mother and with her memories of her childhood, and can come to a place where she no longer looks to outside causes for her mother’s shortcomings. Self-centered mothers come in all colors of the political spectrum. Feminist mothers can be bad mothers. However, they can also be wonderful.